Twisted light brown hide cord tied into a knot at the top (Pantone 7508C). 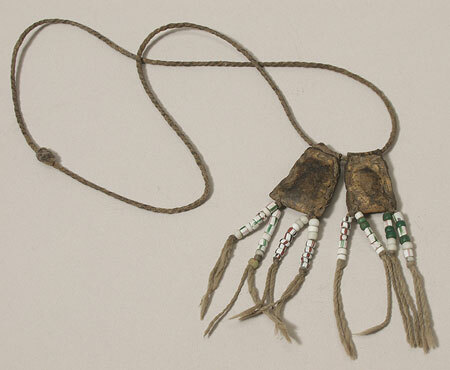 This has been strung with two small hide pockets that were probably used as containers for a charm or amulet, such as a phrase from the Koran. Each capsule is made from a rectangular piece of yellowish brown hide (Pantone 7508C) that has been folded over at the top to form a loop through which the cord may pass; the strip is then doubled over at the bottom to form a small pocket whose edges have been sewn together using a narrow strip of hide in a tacking stitch that runs up either long side and across the top; this also serves to secure the loop. The inside of each pocket is not visible, but their thickness suggests that they are full. The base of each capsule is decorated with two tassels, attached by threading a fibre cord through the lowest thong stitch on each bottom corner so that the two ends are of equal length and hang down. These cords appear to be made of two strands twisted strands, and have been threaded with a series of glass ring shaped and short cylindrical beads; the cord is knotted below this and then these strands separate to form a tassel. The beads do not form a regular pattern in colour or number. The smaller of the two capsules is decorated with 33 beads, arranged in strings of 8, 8, 9 and 8 beads and comprising in total of 7 opaque green (Pantone 555C) and 8 white ring beads, mixed with 4 white ring beads decorated with dark and light red stripes, and 8 short cylindrical white beads decorated with pink and green stripes. The larger capsule is decorated with 27 beads, arranged in strings of 7, 7, 6 and 7 beads which are made up in total of 10 white ring beads, 12 white ring beads decorated with light and dark red stripes (red = Pantone 483C), 1 yellow ring bead with red and green stripes (Pantone 393C), and 9 white ring and cylindrical beads decorated with pink and green stripes. The object is complete and intact. It has a total length of 365 mm, and weighs 9.8 grams. The cord has a diameter of 2.1 mm. The smaller capsule is 90 mm long including tassels, while its body is 27 mm long, 20 mm wide and 7.5 mm thick at its broadest part. The larger capsule is 95 mm long including its tassels, while its body is 32 mm long, 23.5 mm wide and 7.5 mm thick at its broadest part. The beads have diameters of 3.5 to 4.5 mm, while their length varies from 2 mm (small white beads) to 4 mm (cylindrical green and pink striped beads). Collected by Donald Gunn in the Southern Sudan and presented to the Pitt Rivers Museum in 1903. Museum records give only the generic provenance of ‘White Nile’ for this item; Gunn appears to have collected Shilluk material from the ‘White Nile’, ‘Upper Nile’, Kodok and Bor, Nuer material from around Lake No, Dinka material from the ‘White Nile’ and Arab material from Omdurman. The wearing of written charms, sewn up into leather packets, is an Arab practice, found in Egypt and the northern Sudan, and this example probably represents its spread amongst Nilotic Sudanese. Schweinfurth, for example, recorded that: "The Nubians and true Arabs ... often wear round their neck and arms a number of ornamental leather sheaths, which contain passages from the Koran; on being asked what is inside they reply, 'it is the name of god'. Such amulets are even bound round the necks of horses and valuable asses” (G. Schweinfurth, 1873, In the Heart of Africa vol. 1, p. 142); Petrie also reported the practice amongst the Egyptian fellahim: “"Many - perhaps most - of the people wear charms, written on paper, and sewn up in leather; they are worn around the neck, on the purse or pouch, or on the top of the cap. Cattle are also sometimes protected by them" (W.M.F. Petrie, 1892, Ten Years Digging in Egypt , p. 169). For a similar Dinka amulet necklace, see 1903.16.123, and for Nuer examples, see 1903.16.126, a necklet, and 1903.16.129, an armlet. The beads found on this example are similar to those seen on sample cards of trade beads; see for example 1937.35.61, made in Venice, and collected by Arkell in Darfur. Currently on display in the Upper Gallery, case 26A. Accession Book Entry [III, p. 110] - 1903 [pencil insert] 16 [end insert] DR D. GUNN Esq., M.B. 40 Dover Street, London, W. June. [...] [p. 114, pencil insert] 122-123 [ticked] [end insert] - [One of] 2 Dinka necklets each with two charm capsules. Additional acession book entry [page opposite 114] - 1903.16.122 No given AP. Card Catalogue Entry - There is no further information on the tribes catalogue card [RTS 19/2/2004]. Old Pitt Rivers Museum label - Charm necklet. DINKAS. WHITE NILE. Pres. by Dr. Gunn. 1903 [front] 1903.16.122 [back] [circular metal-edged label, stored in RDF; RTS 19/5/2005]. Current display label - SUDAN, LAKE NO; DINKA. Neck ornament with two 'charm' hide capsules and beaded decoration. Donated by D. Gunn. 1903.16.122 [in case U.26.A; RTS 28/6/2004]. Sparks, Rachael. "Dinka neck amulet" Southern Sudan Project (in development). 03 Jan. 2006. Pitt Rivers Museum. <http://southernsudan.prm.ox.ac.uk/details/1903.16.122/>.